Colors: Fawn or brindle or red, each with black markings on the head. The Bullmastiff is very powerfully built, but not cumbersome, with a broad wrinkled head and fairly short, square, dark muzzle about 1/3 the length of the whole head,. The nose is black with large nostrils. The dark hazel, medium-sized eyes should have an alert, intelligent expression. The v-shaped wide-set ears are pendant and dark colored. The teeth should meet in a level or slightly undershot bite. The short back is straight and level between the withers and the loin. The tapering tail is set high and reaches to the hocks. 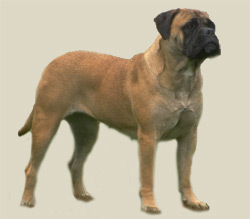 The short, slightly rough coat comes in brindle, fawn, or red, often with black markings on the head.